Advertising aimed directly at kids has long been linked to an increased risk that children will make unhealthy food choices. Children who saw ads for specific sugary cereals in the past week, as well as at any time during the study period, were significantly more likely to eat those cereals. Young children are more likely to demand specific sugary cereals for breakfast when they have seen television ads for these products, a US study suggests. Advertising aimed directly at kids has long been linked to an increased risk that children will make unhealthy food choices and press their parents to buy them more processed, sugary, and calorie-loaded foods at the store, previous research has found. For the current study, researchers surveyed parents of 624 preschool-age children every eight weeks for a year to see what network television shows kids watched and how often they ate breakfast cereals promoted in ads during these programs. The study focused on 10 cereals: Cinnamon Toast Crunch, Cocoa Pebbles, Cocoa Puffs, Froot Loops, Frosted Flakes, Fruity Pebbles, Honey-Nut Cheerios, Lucky Charms, Reese’s Puffs and Trix. Children who saw ads for specific sugary cereals in the past week, as well as at any time during the study period, were significantly more likely to eat those cereals than kids who didn’t see the ads at all, researchers report in the American Journal of Preventive Medicine. Parents may not be aware of how much advertising can influence what kids demand for breakfast, said lead author Jennifer Emond of the Geisel School of Medicine at Dartmouth College in Hanover, New Hampshire. “These young children don’t buy these cereals on their own,” Emond said by email. “Instead, it’s likely that children see TV ads for these cereals and then ask their parents to buy the advertised brands,” Emond added. Parents may be able to limit this influence by switching to ad-free programming for kids, Emond advised. The children in the study were between 3 and 5 years old. The cereals in the study had the most sugar among brands advertised to children, with about 9 to 12 grams of added sugar per ounce. That translates to more than 28 grams per serving, exceeding the maximum amount of daily recommended sugar intake for kids, researchers note. To determine if kids saw ads for certain cereals, researchers asked parents about how much time children spent watching 11 national children’s networks. Then, researchers looked at how often the networks aired ads for specific cereals; they assumed kids saw these ads if they aired often on networks the children watched a lot. Children who saw ads within the past week were 34 per cent more likely to eat specific sugary cereals than kids who didn’t see the ads, the researchers found. And seeing the ads at any point during the study was associated with a 23 per cent higher likelihood of consuming sugary cereals. The combination of seeing the ads in the past week and at any time during the study period was tied to a 37 per cent higher likelihood children would eat the cereals. 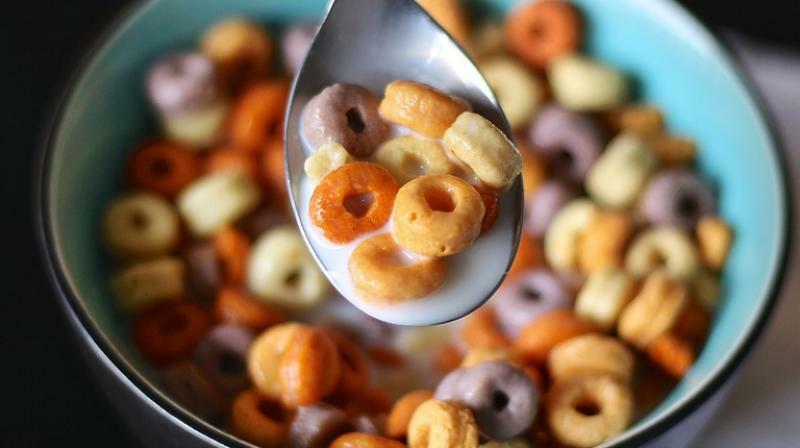 The study can’t prove whether the ads caused children to eat more sugary cereals, and it also did not examine how eating these cereals might impact children’s health. “It is always difficult to evaluate the long-term effect of eating such cereals,” said Helen Coulthard, a researcher at De Montfort University in Leicester, UK, who wasn’t involved in the study. While a bowl of these cereals often has as much sugar as an entire candy bar, the health effects depend on how much sugar is in the other things kids eat and drink, Coulthard said by email. Among other things, consuming too much sugar in childhood is associated with an increased risk of diabetes, obesity and certain behavior and emotional problems. “The problem is that high-sugar cereals are only one of many high-sugar products that children will eat in a day,” Coulthard added.